Podere Valdibotte is a typical Tuscan country house amidst vineyards and olive groves in the hills of Scandicci southwest of Florence with a beautiful view on Villa Antinori and San Martino alla Palma. 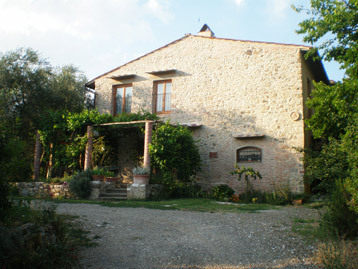 The property consists of vineyards, olive grove, fruit and vegetable garden and paddock.. The house itself has been recently restored with full respect of Tuscan style and the use of original materials. The house is surrounded by a big natural garden with a pool and shady pergolas for relaxing after visiting the sights of Florence. Olive oil, wine, fruit and vegetables are home-grown. View of garden and pool.